If you’re looking forward into improving your typing speed, which you most likely are, considering you’ve actively tried to find a better keyboard layout, then you’re surely tired of hearing the famous phrase: ,,Just practice more!”. After all, who wouldn’t? Truth be told, the amount of time spent practicing is just the first part of the equation, the quality of the practice being the equally important second part, not to forget the slight advantage of having better equipment, and couple of other factors, but let’s keep that for later! The sword is only as strong as it’s master! But.. While no tier of quality of equipment will substitute skill, it makes typing a lot more satisfactory, and the higher your skill is, the bigger the difference will be. A lot of it is pure preference, but there’s one thing that’s purely objective: Go for the most responsive equipment! There’s no questioning that any keyboard layout that was designed with typing in mind will be way more effective than one that was designed with typewriter’s jams in mind. There are many layouts, but it’s not worth going into a great detail, there are 3 main ones worth talking about, sorted by popularity, they are: Qwerty > Dvorak > Colemak. With all things in mind, the arrows turn the opposite direction when talking about quality: Qwerty < Dvorak < Colemak. Meanwhile the Dvorak and Colemak layouts are nearly equal, Colemak’s easier accessibility scores many bonus points. There are couple of layouts that are, mathematically speaking, even better than Colemak, however, it’s just pure mechanistic speculation with arbitrary scoring systems at this point. No one is denying the possibility of a slight advantageous nit-pick, however, it’s not worth going this deep down the rabbit role. Needless to say, many of these layouts suffer from their strong department from Qwerty, making relearning that much harder. Many fast typists have picked up detrimental habits on their way up, while they may say that they are, in fact, not detrimental, don’t believe them. No person can tell what the opposite is like, which in this case would be typing properly, without giving it a proper go first. Utilize all the fingers you can and divide the required effort evenly among them. Using all fingers is undoubtedly better than using fewer. 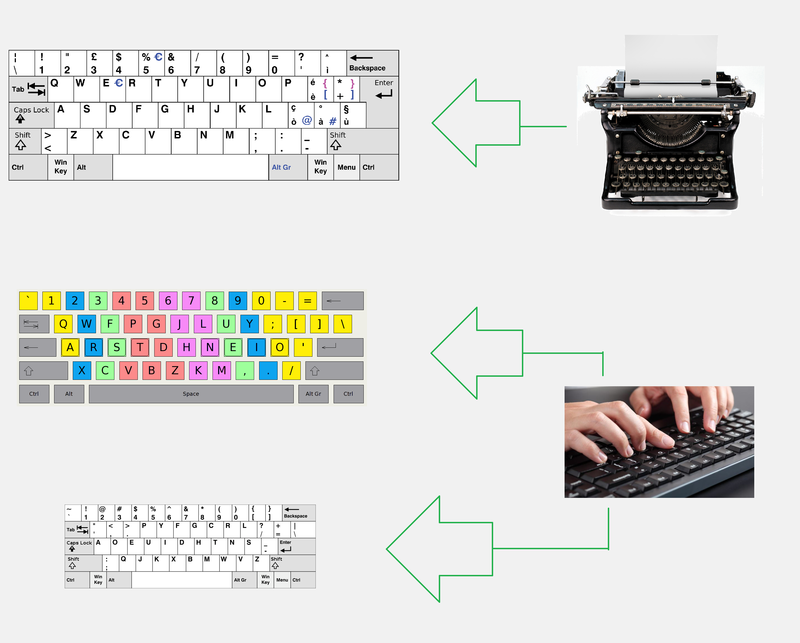 If the standard homerow technique is the most efficient technique isn’t all that questionable, considering keyboards and layouts, like Colemak, were made with homerow in mind. However, there are couple of changes I’d suggest to try out to improve your experiences with it. The way you practice matters as much or even more than how much you actually practice. Type mistakes consistently enough, and you’re already learning to do the mistakes. Your muscle memory doesn’t distinguish between ,,good patterns” and ,,bad patterns”, be careful! With this in mind, it’s clear cut that you should spend majority of your practice on sites that force you to fix your typos or that penalize you for making them, which will instinctively make you focus on typing more accurately. On sites that do not do such a thing, set an accuracy bar that you’d never go below, high enough to make practice positive, but not so high that it will make practice outright frustrating. More importantly than all of that, make sure you actually enjoy yourself while practicing! It’ll make reaching higher consistency and accuracy that much easier. There are enough ways to practice for everyone, no point in choosing something you despise. Make sure you try your best to get rid of all of the unnecessary excess stress in your life. Maintain a healthy diet rich in whole plant foods, checked occasionally with a program like Cronometer to make sure you get past the minimum daily requirement of all the necessary micronutrients. Exercise frequently. Get rid of any unhealthy habits. Make your practicing environment as calm as possible and remove all the distractions. The more you do to eliminate the stress the better! The end. Have fun, be consistent, and keep your variety fresh to expect improvement! If it's okay (or actually anyway, lol!) I'll link to this. Maybe you could mention in section 2 that others (like myself) actually move keys around in an Angle mod to get the better wrist angle (and also a better B placement)? You don't have to write much about it, just mention it. If you wish, you could link the curious to the Big Bag. Viper, my man! Fantastic guide. I actually already carry out most if not all of these principles. But it's nice to have some validation from the guy that cracked 200wpm on everyone's favorite layout. Excellent guide Viper! You can't argue with the best name in Colemak typing. Hypothetically if you're a 100 WPM typist like me, you can double your typing speed using the advice above with enough quality practice. That's a lot of good advice, and I have found typegun to be very good practice, it's focus on typing very accurately, at least in the challenges is very helpful, it feels quite frustrating failing the challenges again and again, but I really noticed that I write a lot better after just practing there for a while. Viper, do you prefer light switches? Which one do you use? Yes! I do prefer switches that are light to actuate, even though it may be frustrating at first to master the feel, I'd still say it's worth it. I use Cherry MX Browns, from my experience, they feel just about right for typing and gaming alike. Yeah, I expected you will say that. I myself prefer heavy tactile switches, like Zealios 67g, or heavy linear like Cheery Blacks. Cherry Clears feel a little too heavy, but also usable for me. Although I’m not a speedy typist and unlikely will be it anytime, it seems that for improving speed it is the way to go to get used to lighter switches. I never liked Browns though. Waiting for Kailh Speed Copper to try, they should be pretty close to Cherry Browns. This is really helpful I will definitely recommend this to my brother.